A few weeks back I wrote on my facebook page that I was planning to try to change a few of my bad habits this year. Not that I have many *ahem*. I’m talking little things that could be changed to make life easier. Evidently many people out there were with me because it generated a lot of discussion and ideas. The first habit I wanted to change was to stop leaving my clothes on the end of the bed or floor when I went to bed at night. Often I would be planning to wear the clothes again so I didn’t put them away, but inevitably, I would end up with a pile. So for the last few weeks I have been putting them away every night. I’ve been forcing myself to be realistic. Either they get hung up or put in the wash basket. No putting of the decision for later! One month in, and it is already becoming a habit. Clothes come off and straight into the cupboard or wash basket. It really only takes an extra 10 seconds, but I wake to a much tidier bedroom every morning. I’ve been thinking about how habits get changed and what has made this small change easy for me. So here are six things I have learnt while trying to change a habit. Pick one thing that is pretty easy to change and start with that. Several people suggested that they were going to charge their phone in the study rather than their bedroom, or were going to put the washing away as soon as it came in from the line, rather than letting it bank up. Choose something that is manageable and then do it for a month. 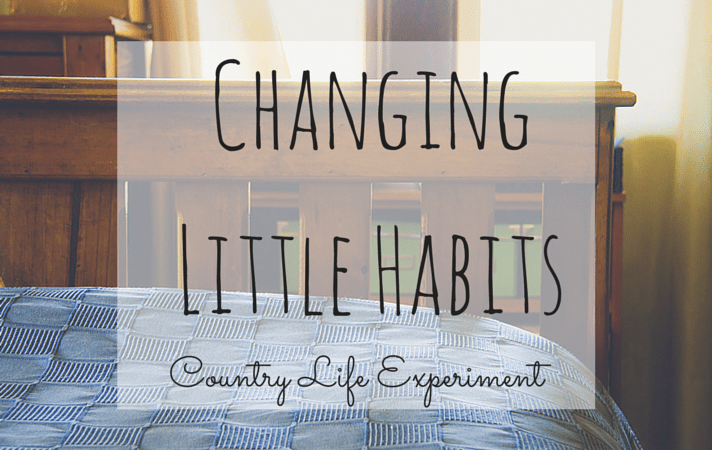 If you’re like me you probably have a *few* habits that you would like to change. I know I have quite a list. It can be tempting to just jump in and to fix them all. I think this ends in burnout. Habits are ingrained and done without much thought. To change them you have to actively think about what you are doing. If you are trying to remember too many new things at once, you will inevitably forget them and revert to your old habits. I would love everything to be picked up off the floor in the playroom and kids room each night as well, but realistically it isn’t going to happen all at once, so I started with “I am going to put away all my clothes every night before I go to bed”. It is something I can actually achieve, and there is no vagueness to give me space to wiggle out of doing it. Every night! There have been several nights in the last month where I have been falling over tired by the time I got to bed. It was so tempting to just drop my clothes and leave them for later, but I made myself do it anyway. I was pretty happy in the morning when I woke to find the end of my bed free from clothing. Some habits really are easier to change than others. I gave myself a month to focus on putting those clothes away. Some other habits might take longer to change. Take your time and don’t go trying to change another habit, until you’re sure the first one has been nailed. If it takes you two months (or longer), so be it! Sometimes the reward is in the task being already done. My reward for putting the clothes away at night is a tidier bedroom. Sometimes though, I need a reward beyond the satisfaction of doing something right. Setting an external reward for yourself is a great way to help motivate you to do the task. Two squares of chocolate after you have put away all the washing, No facebook until after you have made the bed in the morning. Whatever motivates you, use it. How do you know when you have changed your habit? I think the answer is when you no longer have to actively remember to do something in the “new” way, then your “new” way is now a habit. When it all comes down to it, the question is how much do you really want to change it? P.S When I’m talking about habits, I’m talking about those little things we do day to day that can be changed with a little hard work and mindfulness. I’m not talking about addictions or those really big, really hard to deal with habits – for those see someone qualified to help you. What small habits would you like to change? Got any more good tips to make changing these little habits easier? What should I tackle next? I think I need to follow you on the sorting clothes habit – I have a clothes stand but things inevitably get tossed over it and it is far from tidy. I also may be out of the habit of making my bed! I thought I was the only one with a small pile of clothes beside my bed. I'm actually making an effort to change this. Slowly. I had been changing my coffee, making one shot decaf and using the more water added choice than less so my coffee has less milk and less caffeine.. I had to remind my self and then today made both mine and hubbys that way without thinking and he didn't even notice!! YAY!! so proud i have made myself wash dishes. i will change this habit! That's a good one. CB does most of the washing up in our house, and the girls wipe up. i would like to change the habit of leaving the dishes until the morning. i love when i get the kitchen clean at night and wake up to a lovely clean kitchen….but well i am lazy at night..i need to start forcing myself to get it done before bed time. Well done! It feels good to have a fresh start. I need to go through my wardrobe in the Easter holidays. It's been a few years since I last decluttered in there so I bet there are some clothes lurking there which I will never wear! Done! Have also done wardrobe and tossed some stuff which was never satisfactory. Tomorrow I plan on redoing bedroom. This is a two bedroom apartment with two large built in wardrobes. I have been here almost four years and had plenty of space till my son moved in 15 months ago. When he arrived I lost half that space. Still need a bit more re-organising but it all feels good and yesterday's dirty clothes are in washing basket instead of far too many clean clothes. Japing??? that would be joining. Arthritic fingers and spell check combined. Right hand is very stiff. Well done. I hear you on the excuses. I have pulled myself together and decided against them. Some months ago, I ripped a ligament japing one side of pelvic girdle to hip or wherever it was. I fell in an uneven set of steps in a poorly lit stree. Sitting is fine. Walking is very awkward. I have given in and bought a walking stick. I hate admitting to needing it as I see it as a sign of pld age. Not that I'm a spring chicken, but it has been a huge help. I have now got up to date on the several lots of shots which were unwashed on my floor. Each time I went to wash them, son already had a load on. Today's job is to sit on the bed and sort the big basket of clean washing. I have a suspicion I will fins some clean winter woolies from springtime last year there. No excuses. Having made the effort, I find the whole thing actually helps my mindset to be more positive. Things have been fairly horrible for my family in m any ways for the last 15 months.